When it comes to body lotions, I have the “Goldilocks” syndrome. Most are either too smelly, too greasy, or too loaded with ingredients that look like the components of jet fuel. I don’t want everyone around me to think I got attacked by a perfume sampler at the mall, I can’t stand feeling like I’m covered in french fry oil, and if I can’t pronounce the ingredients, I’ll probably be hearing on the news one day that they’re deadly to humans. I always had a hard time finding one that was juuuuuuust right… until I tried Pure Paradise. Over the years, Renee Snow has become somewhat of a mad scientist in the quest to create an all-natural cream for herself and her massage therapy clients. I admit that I was skeptical when I got the lavender-scented lotion…I’m picky, and most skin creams I’ve tried rate somewhere between “ehhh” and “so-so”. Within a minute, though, the Goldilocks in me was hooked. It wasn’t too thick or too runny, it smelled pleasant but wasn’t obnoxiously strong, and it hydrated my skin but didn’t leave it feeling greasy. The most shocking thing of all is that every single ingredient was not only pronounceable, but also recognizable! Organic coconut oil, aloe, and essential oil? Easy. Distilled water, beeswax, and vitamin E? Duh. Bye bye sulfates, parabens, and other nasty ingredients that are commonly used in commercial products! 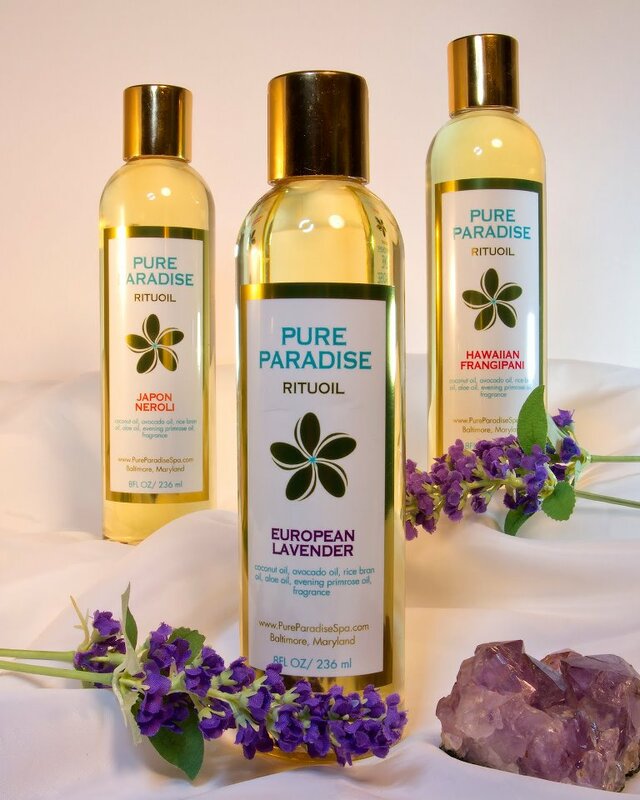 Another Pure Paradise product that I LOVE is the Rituoil line of body oils. They are perfect for daily use after bathing or for massages. Again, the scents are beautiful without being overpowering, and they absorb quickly, leaving skin feeling soft and hydrated. Plus, it only takes a dime-sized amount to cover your whole leg, so one bottle lasts a long time. The best part is that although she uses high-quality ingredients, she doesn’t charge sky-high prices. In fact, 8-ounce bottles of lotion or oil sell for around $15! They come in a variety of different scents, and are readily available on her site or through Ebay. You can also find out about new products and services on her Facebook page. Enjoy! This entry was posted in Health & Beauty, Products, Vene-Vendors and tagged beauty, budget-friendly, lotion, natural, organic, products, recommend. Bookmark the permalink.